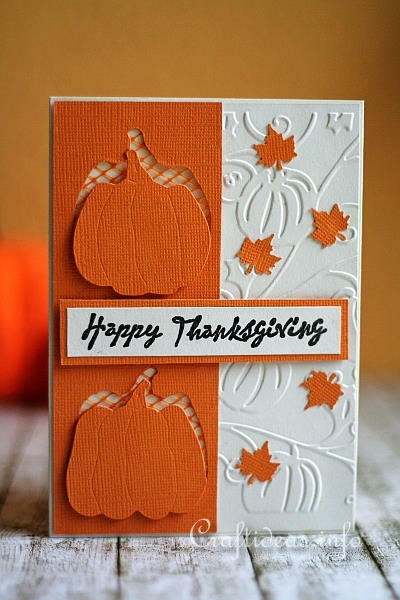 This card uses a couple of different paper craft techniques such as embossing and stamping. 1. Emboss the pumpkins onto off-white cardstock that is slight more than half the width of the card and almost the same height as the card. Cut the cardstock. Adhere this piece now to the right side of the card. 2. Cut a strip of orange cardstock that is half the width of the card and almost the same height. Die cut two pumpkins onto this piece and turn it around. Adhere a piece of netting with tape to the backside of the strip. Turn the strip over and now adhere it to the left side of the card. Adhere the 2 pumpkin cut outs slightly under the openings with 3-D foam tape. 3. Stamp “Happy Thanksgiving” and cut it out. 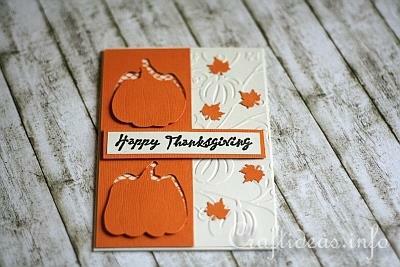 Glue it onto orange cardstock and cut out with a small border. Adhere the message to the card using 3-D foam tape. 4. 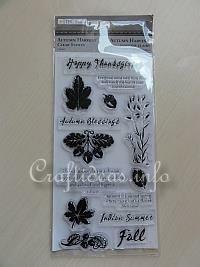 Punch out a few maple leaves and glue these to the right side of the card. The peek-a-boo area behind the orange pumpkins is potato netting. It just seemed to useful to throw away. It is possible where you live, that the netting looks different so you may have to purchase orange netting instead. Copyright: Please read the information found in the link below concerning the copyright of this website.